In a previous blog post, I announced my SuperScript step for PDI, which adds and enhances some capabilities of the built-in Script step. One notable addition is the ability to use AppleScript on a Mac, as the AppleScript script engine comes with the Mac JDK. However the implementation of the script engine is a bit different than most other script engines, especially in terms of getting data into the script as variables, arguments, etc. If you just want to call a script for every row (without using incoming fields), you can just write straight AppleScript. However if you want to use incoming field(s), you have to do a little magic to get it all working. javax.script.argv: This variable is set to the value to be passed to the function. Since PDI doesn't have a List type, you can only pass one argument into your function in SuperScript. If you need multiple values, you'll have to concatenate them in PDI and pass them in as a single field value. return testVal & " World!" The above picture doesn't show it but for the "result" output field I set "Script result?" to "Y". This way I can use "result" with "Hello World!" later on in the transformation. 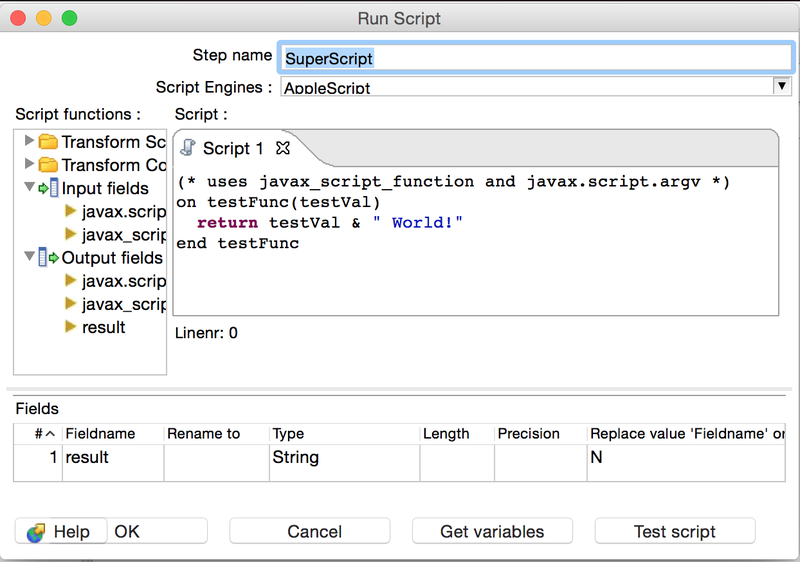 Hopefully this helps demystify the use of AppleScript with SuperScript in PDI, and allows you to leverage powerful Apple capabilities alongside the powerful capabilities of PDI. Cheers!